Fragrant plants are powerful in many ways. They can modify our mood and change our frame of mind. They can reduce stress and leave us with a sense of contentment. They can also attract pollinators, deter predators, and allow plants to communicate with one another. Because of all this, they play a key role in successful garden design. In The Aromatherapy Garden Kathi Keville, and internationally-known aromatherapist and herbalist, shows the reader how to create a beautiful, scent-filled garden. This detailed guide offers tips on how design for fragrance, with tips on where to place plants, how to layer the aroma, and advice on companion plants. A plant directory includes growing information and aromatherapy uses for 88 fragrant plants. And a section dedicated to bring fragrance indoors includes simple techniques for making potpourri, herbs, dried wreaths, herb pillows, natural cleaning products and teas. This lushly photographed guide is for gardeners, herbalists, and people looking for a thorough introduction to fragrant plants. 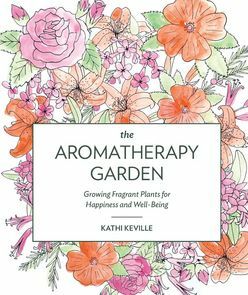 This rich and detailed guide includes information on growing fragrant plants at home, using them in garden design, and taking advantage of their powerful medicinal properties through aromatheraphy.